Coinciding with the recent tragic suicides of celebrities Anthony Bourdain and Kate Spade, the U.S. Centers for Disease Control and Prevention (CDC) reported the suicide rate in the U.S. jumped 30 percent from 2000 to 2016. In light of such high-profile suicides, there are, naturally, calls for “more effective treatments” for depression. However, Citizens Commission on Human Rights (CCHR) International, a mental health industry watchdog, warns that these calls can include demands for more antidepressants without investigating how these and other treatments may be a potential cause of, or contributing factor in, suicides. CCHR cited how psychiatric drug prescriptions, including sedatives, antidepressants, psycho-stimulants and antipsychotics, increased 117 percent from 1999 to 2013 and, during that same time period, the CDC had reported the suicide rate had increased 24 percent. Within three years, that figure is now 30 percent. A CDC survey also found the number of Americans who took an antidepressant over the past month — despite 49 official psychiatric drug warnings of the adverse effects of self-harm, suicide or suicidal thoughts — rose by 65 percent between 1999 and 2014. Fashion designer Ms. Spade was taking medication for her depression, while it’s unknown whether chef-turned-TV-host Mr. Bourdain was taking any psychotropic medication, although he was seeing a therapist in 2016 that featured in scenes of his show “Parts Unknown.” Whether or not there was a psychotropic drug involved, it should be incumbent upon health authorities in light of their tragedies, and with any suicide, to investigate if and what treatments were administered, CCHR says. This includes the potential for adverse withdrawal effects if a person stops taking psychotropic drugs, for example. CCHR says such an investigation is needed because the suicide rate continues to climb despite 43 million Americans taking antidepressants. The suicide doesn’t have to be from a drug overdose; CCHR is looking at what chemically may contribute to a person committing self-harm. Often prescribed to treat depression, a 2018 study published in Frontiers in Psychiatry concluded that “antidepressants are largely ineffective and potentially harmful.” Lead researcher Michael P. Hengartner at the Zurich University of Applied Sciences in Switzerland conducted a thorough literature review focusing on randomized, controlled trials — the gold standard of evidence-based recommendation. Hengartner cited evidence that the likelihood of relapse is also correlated with duration of treatment. That is, the more one takes an antidepressant, the likelier one is to have another episode of depression. After 30 years of the new “miracle” SSRI antidepressants, psychiatrists now say that for at least a third of those taking them, the drugs don’t “work.” In one study, psychiatrists admitted the failure rate to be as high as 46 percent. Research confirms that antidepressants may not be effective at all. In a 2014 study, Irving Kirsh, associate director of the Program in Placebo Studies at Harvard Medical School, stated, “analyses of the published data and the unpublished data that were hidden by drug companies reveals that most (if not all) of the benefits [of antidepressants] are due to the placebo effect.” In February 2018, a study published in Lancet, asserting the opposite, had been conducted by researchers with strong financial ties to the pharmaceutical industry, CCHR reports. Of the 522 trials in their analysis, 409 were funded by pharmaceutical companies. Because of antidepressant ineffectiveness, today, an antipsychotic — normally limited to treat severe psychosis or “schizophrenia”— can be prescribed as an “add-on” to the antidepressant — mindless of any adverse chemical reaction this may cause. Glen Spielmans, Ph.D., a researcher and associate professor of psychology at Metropolitan State University in St. Paul, conducted a review of 14 previous randomized clinical trials in which the combined use of an antidepressant and an antipsychotic were compared to the use of an antidepressant with a placebo. “In terms of quality of life and how well people were functioning, there was really not much evidence that these drugs did anything,” said Spielmans. A 2017 Journal of Clinical Psychiatry study found non-response rates with first- and second-line antipsychotics as high as 25% and 83%, respectively. 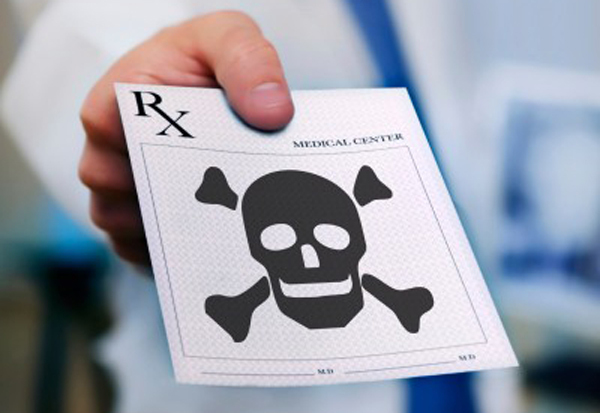 CCHR further warns that when these drugs not only fail but potentially worsen or harm the individual, electroconvulsive therapy — shock treatment, using up to 460 volts of electricity — is often administered. A 2017 comprehensive review of 89 studies on electroconvulsive therapy since 2009 found none proved it effective and that maintenance ECT involved participants being on “medication” again following the ECT. In one Norwegian study of 120 patients, 56 (47 percent) who were described as having shown improvement after the first ECT series suffered a relapse in the first six months. A total of 86 (72 percent) suffered a relapse after an average of 13 months. After the first ECT series, 84 patients (70 percent) received antidepressants and/or lithium, while 87 of 100 received ECT again and within another six months, 58 (67 percent) relapsed again. A Review of ECT studies in 2010 and again in 2017 also reported that there was no evidence, of any kind, in support of the theory that ECT prevents suicide. Thousands are supporting a petition calling for a ban on the ECT device. Click here to read and sign the petition. Jan Eastgate, the president of CCHR International, who has twice testified before the Food and Drug Administration on this issue, said the term “treatment resistant depression” is “disingenuous and misleading, implying fault on the part of the patient or his or her ‘disease’ rather than treatment failure and damage. It’s a terrible injustice to the consumer who, desperate for relief, can give up hope, unaware of the influence a drug, withdrawal from it or electroshock may be having on their thinking.” More public information is needed, she said, which is why CCHR maintains a Psychiatric Drug Side Effects Database for people to become better informed until such time as governments investigate the correlation between treatment and suicide. “The US suicide rate has increased 30% since 2000 — and it tripled for young girls,” Business Insider, 15 June 2018, https://www.msn.com/en-us/health/wellness/the-us-suicide-rate-has-increased-30-25-since-2000-e2-80-94-and-it-tripled-for-young-girls/ar-AAyCArX. “Psychiatric Medications Kill More Americans than Heroin,” Rehabs.com, 5 Jan. 2016, citing: MEPS (Medical Expenditure Panel Survey) database, https://www.rehabs.com/pro-talk-articles/psychiatric-medications-kill-more-americans-than-heroin/; Sally C. Curtin, M.A., Margaret Warner, Ph.D., and Holly Hedegaard, M.D., M.S.P.H., “Increase in Suicide in the United States, 1999-2014,” NCHS Data Brief No. 241, Apr. 2016, https://www.cdc.gov/nchs/products/databriefs/db241.htm. “Psychiatric Drugs: Create Violence & Suicide,” Citizens Commission on Human Rights International, March 2018, p. 5, https://www.cchrint.org/pdfs/violence-report.pdf. Laura A. Pratt, Ph.D., Debra J. Brody, M.P.H., and Qiuping Gu, M.D., Ph.D., “Antidepressant Use Among Persons Aged 12 and Over: United States, 2011-2014,”Centers for Disease Control and Prevention, Aug. 2017, https://www.cdc.gov/nchs/products/databriefs/db283.htm. IQVia Total Patient Tracker (TPT) Database, Year 2017, Extracted April 2018. Andreas Ø Bielefeldt, et al., “Precursors to suicidality and violence on antidepressants: systematic review of trials in adult healthy volunteers,” Journal of the Royal Society of Medicine, October 2016, Vol. 109, No. 10, p. 381, http://jrs.sagepub.com/content/109/10/381.full; Stephan Barlas, ” FDA Adds Young Adults to Black Box Warnings on Antidepressants,” Psychiatric Times, I June 2007, http://www.psychiatrictimes.com/addiction/fda-adds-young-adults-black-box-warnings-antidepressants. “Patient Online Report of Selective Serotonin Reuptake Inhibitor-Induced Persistent Post-withdrawal Anxiety and Mood Disorders,” Psychotherapy and Psychosomatics, 19 Jan. 2012, https://www.karger.com/Article/FullText/341178. Joanna Moncrieff, M.B.B.S., David Cohen and Sally Porter, “The Psychoactive Effects of Psychiatric Medication: The Elephant in the Room,” J Psychoactive Drugs, Nov. 2013; 45(5): 409-415, https://www.ncbi.nlm.nih.gov/pmc/articles/PMC4118946/; Smitha Bhandari, “Treatment-Resistant Depression,” Web M.D., 23 June 2017, https://www.webmd.com/depression/guide/treatment-resistant-depression-what-is-treatment-resistant-depression#1. Irving Kirsch, “Antidepressants and the Placebo Effect,” NCBI, 2014, https://www.ncbi.nlm.nih.gov/pmc/articles/PMC4172306/; The Harvard Catalyst, https://connects.catalyst.harvard.edu/profiles/display/Person/96221. Traci Pederson, “Adding Antipsychotic Meds to Antidepressant Shows Risk, Little Benefit,” Psych Central, https://psychcentral.com/news/2013/03/14/adding-antipsychotic-meds-to-antidepressants-shows-risk-little-benefit/52597.html; John Lally, James H. MacCabe, “Antipsychotic medication in schizophrenia: a review,” British Medical Bulletin, 1 June 2015, pp. 169-179, https://academic.oup.com/bmb/article/114/1/169/246291. John Read and Chelsea Arnold, “Is Electroconvulsive Therapy for Depression More Effective Than Placebo? A Systematic Review of Studies Since 2009,” Ethical Human Psychology and Psychiatry, Volume 19, Number 1, 2017, http://www.ingentaconnect.com/content/springer/ehpp/2017/00000019/00000001/art00002.